There is no charge for the conference, and lunch is provided. However, advanced registration is required by March 15. 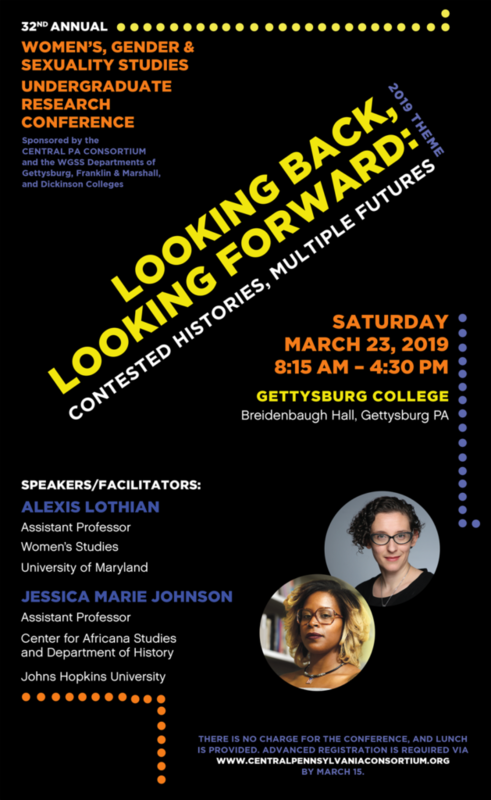 The Central Pennsylvania Consortium (CPC), comprised of Dickinson, Franklin & Marshall, and Gettysburg Colleges, announces its Annual Women’s, Gender, and Sexuality Studies Conference. The 2019 WGSS comes at a time of heightened activism around the world as the U.S. and much of Europe move to the right politically as seen in resistance movements such as Black Lives Matter, Women’s March on Washington, #Metoo, etc. Transnational forms of feminism have thrived, along with on-going efforts to decolonize US and European feminisms by recognizing contributions of women from other world regions. Queer and Trans activism and theories have been challenging and enriching the discipline, along with Disability studies. There has also been an effort to rethink the “history” of the U.S. women’s activism in order to include the histories of those who were involved in anti-lynching campaigns, indigenous rights movements, the Civil Rights movement, immigration advocacy, the Chicano/a Movement, the labor movement, and civil rights for LGBTQ people, among others. How can those of us committed to social justice tell these stories in a more inclusive way (looking back at contested histories)? How can we move forward to form coalitions for social change (looking forward to multiple futures)? How can we better craft theories and practices that “lead to liberation, making the connection between our past and our future,” as Barbara Smith phrased it? The symposium aims to examine the intersections between soccer and social justice from an interdisciplinary perspective. As the most popular sport on the planet, soccer can often perpetuate stereotypes of identity, such as gender, sexuality, race/ethnicity, class, religion and national or regional origin. More than any other sport, soccer has the power to unite and/or divide people. The reach and popularity of soccer offer unique potential to open spaces for contestation of injustices within greater society. This one-day collaborative event sponsored by the CPC and its member institutions will bring together a diverse group of scholars, journalists, students, athletes, coaches and community members to discuss issues of equality and representation in soccer with a focus on the past, present, and future of the sport. With the hope of expanding the conversation to the greater field of sport studies, undergraduate students from any institution are invited to submit abstract proposals (250-word maximum) to present research projects (at any stage of development) in poster form on issues of social justice in an area of sporting activity. All are invited to attend the CPC Africana Studies Conference: #Envisioning Black Digital Spaces that will take place this Saturday, April 9, 2016. Panel presentations will be in Stern Great Hall from 9:00 am – 3:40pm. The keynote address will be delivered by Alicia Garza co-founder of #BlackLivesMatter in Allison Great Hall at 4:00 pm.